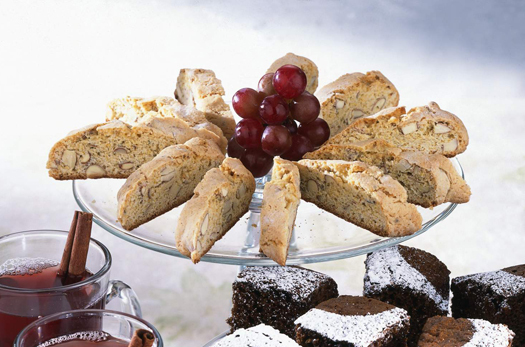 These delicious Italian cookies are a wonderful accompaniment to coffee, tea, sorbets, ice cream, and fresh or poached fruit desserts. They can be stored in a covered container for a week or two. Preheat the oven to 375 degrees F. Spray 2 baking sheets with nonstick spray or lightly butter them with extra butter. Dust both sheets lightly with a small amount of flour and set aside. In a medium bowl, beat the butter and sugar until creamy and fluffy. Add the eggs and beat together. Add the vanilla and beat to combine. In another bowl, combine the flour, baking powder, lemon zest, anise, and nuts. Stir to mix. Add the dry ingredients to the wet ingredients, about one third at a time, stirring to combine after each addition. Divide the dough in half. On a lightly floured surface, roll the dough into two logs about 2 inches in diameter. Shake any excess flour from the baking sheets and transfer one log to each baking sheet. Bake until the logs are lightly golden and show a few cracks on the top, about 30 minutes. Remove from the oven and set on a rack to cool. Reduce the temperature to 250 degrees F.
When the logs are cool enough to touch, slice the logs on the diagonal with a very sharp or serrated knife. Make 1-1/2- to 2-inch wide slices. Return the slices to the baking sheets. Bake until the biscotti begins to dry out, about 15 to 20 minutes. Cool on a rack. Replace the anise with 1 teaspoon cinnamon. Replace the nuts with 2/3 cup raisins. Proceed with the recipe as directed. Per serving: Calories 58 (From Fat 22); Fat 2g (Saturated 1g); Cholesterol 8mg; Sodium 17mg; Carbohydrate 8g (Dietary Fiber 0g); Protein 1g.